The Royal Coachman was first made in 1878 by John Haily, a professional fly-dresser living in New York City. In writing of other matters, he inclosed [sic] a sample of this fly for us to see, saying: "A gentleman wanted me to tie some Coachmen for him to take up into the north woods, and to make them extra strong, so I have tied them with a little band of silk in the middle, to prevent the peacock bodies from fraying out. I have also added a tail of the barred feathers of the wood-duck, and I think it makes a very handsome fly." A few evenings later, a circle of us were together "disputing the fly question," one of the party claiming that numbers were "quite as suitable to designate the flies as so many nonsensical names." The others did not agree with him, but he said: "What can you do? Here is a fly intended to be a Coachman, yet it is not the true Coachman; it is quite unlike it, and what can you call it?" Mr. L. C. Orvis, brother of Mr. Charles Orvis, who was present, said: "Oh, that is easy enough; call it the Royal Coachman, it is so finely dressed!" And this name in time came to be known and used by all who are familiar with the fly. The Royal Coachman pattern is one of the very few patterns that appeared in Marbury's work that is still being tied and fished today in some form or another. The Royal Coachman and its derivatives are considered attractor patterns, or as Dave Hughes in Trout Flies-The Tier's Reference (1999) calls them—searching patterns—as they do not resemble any specific insect or baitfish. Early in the 20th century, Theodore Gordon once was of the opinion that the Royal Coachman resembled some form of flying ant, while in the 1950s, Preston Jennings, a noted fly tier and angler thought the Royal Coachman resembled Isonychia mayflies. The distinguishing features of any Royal Coachman or its derivatives are the peacock herl body partitioned with red silk or floss, a white wing and brown or red-brown hackle. 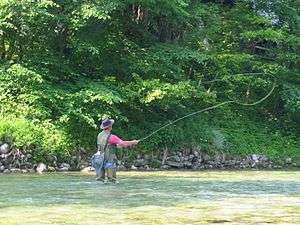 Depending on whether the fly is tied as a dry fly, wet fly or streamer the white wing can be made with white duck quill, bucktail, calf tail, hen neck, hackle points or other white material. Tailing has varied over the years from the original wood duck flank to include golden pheasant tippet, brown or red hackle, moose, elk and deer hair. ↑ Schullery, Paul (1999). Royal Coachman-The Lore and Legends of Fly-Fishing. New York: Simon and Schuster. pp. 116–117. ISBN 0-684-84246-7. ↑ Marbury, Mary Orvis (1892). Favorite Flies and Their Histories. Boston and New York: Houghton Mifflin and Company. p. 97. ↑ Hughes, Dave (1999). 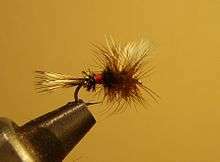 Trout Flies-The Tier's Reference. Mechanicsburg, PA: Stackpole Books. pp. 47, 64, 131, 154. ISBN 978-0-8117-1601-7.